A distant signal at Vr 2: expect slow. Below you see a Zs 3v speed announcing signal. The announced speed is 30 km/h. 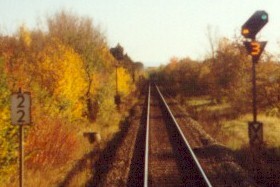 Far below there is an Ne 2 board (distant signal post plate). To the left we see an hectometre board, telling us we're at kilometre 2.2. 1000 m behind the distant (look at the hectometre board: we're at kilometre 1.2 now), from top to bottom we see: A Zs 3 speed signal imposing 30 km/h, a main signal at Hp 2: slow (which would be 40 km/h if there was no Zs 3), a distant signal showing Vr 0: expect stop, and the main signal's post plate. Note that the shapes of the Zs 3 and Zs 3v are irrelevant (the triangle could face anyway up or down or could be missing), a Zs 3 has white numbers and a Zs 3v amber ones. 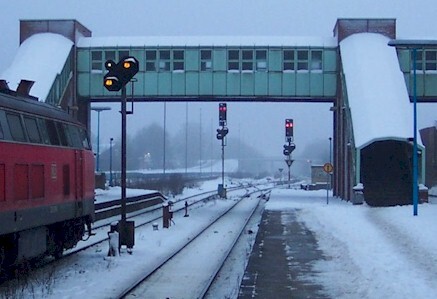 At Ahrensburg track 3 towards Hamburg, the exit signal shows green-yellow. This is aspect Hp 2: clear with medium speed. 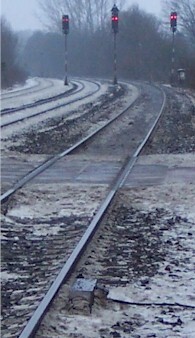 The distant signal below displays Vr 1: expect clear. 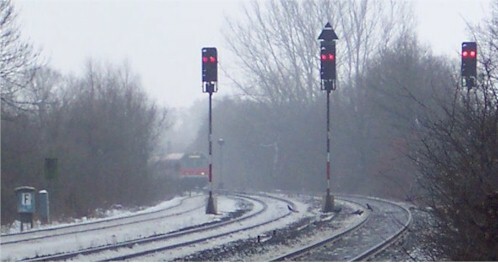 The additional white light indicates that the distance to the next main signal is shorter than usual. The triangular sign is a Zs 3 board imposing a speed limit of 60 km/h in the following points zone. Far below is the white-red-white post plate. 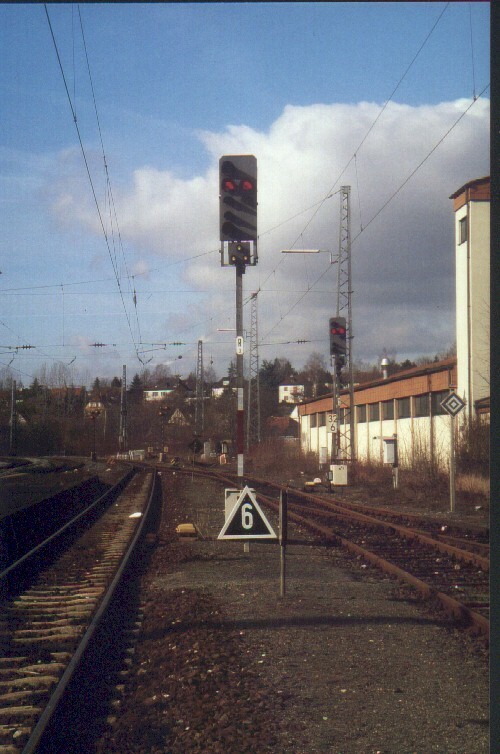 The signal to the right shows Hp 0 with the (now obsolete) double-red aspect. The distant signal is dark. 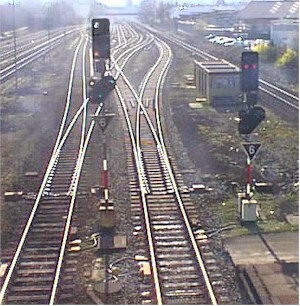 Note that this signal is lower, because it is behind a bridge and must be seen from the platform before that bridge. Between the main and distant heads you can see a small square box, that is a Zs 1 substitution signal. The same signal. To the left you see a distant signal repeater that is used to indicate the aspect of the exit signal which is hidden behind the bridge. 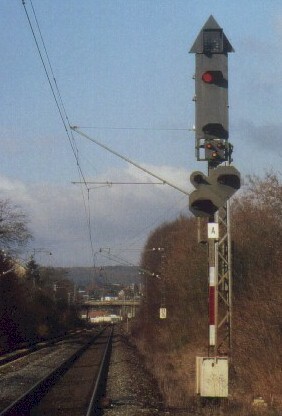 A close-up of the exit signals towards Hamburg-Rahlstedt. 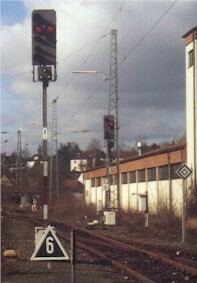 Northbound, towards Bargteheide, this distant signal repeater is located under the platform roof to indicate the exit signal aspect for passing trains. 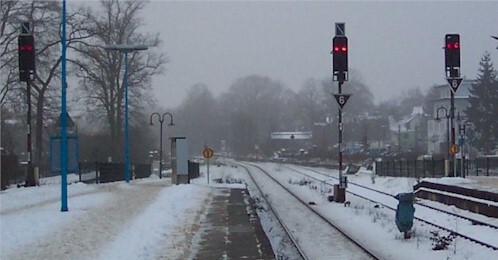 The trains that leave the left tracks will continue in the left track after exiting the station, so the corresponding exit signals carry a Zs 6 track changing indicator board. 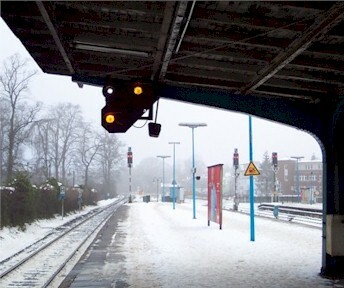 Southbound exit signals at Bargteheide. 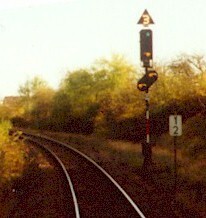 The centre signal carries a Zs 3 speed signal for trains that had halted on the left or centre track and will switch to the right track on the open line. 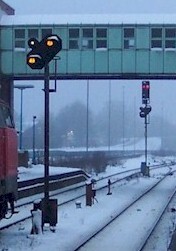 The signal in the background, next to the loco, is a Zs 6 track changing indicator. 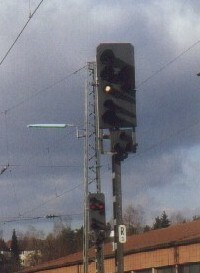 The square boxes below the main signal heads carry three white light to display a Zs 1. The box with the "F" is the signal telephone. In the lower right, you see the 500 Hz Indusi magnet protecting the right exit signal. 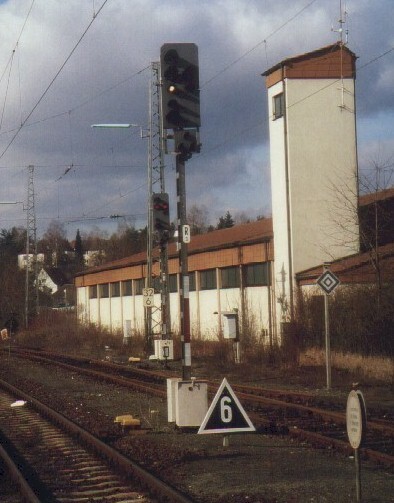 This distant signal in Hamburg Hbf indicated the aspect of the exit signal hidden behind the platform roof, so it is closer than braking distance (as we see by the white light). This signal does not have the usual shape but a more modern (and space saving) compact head. 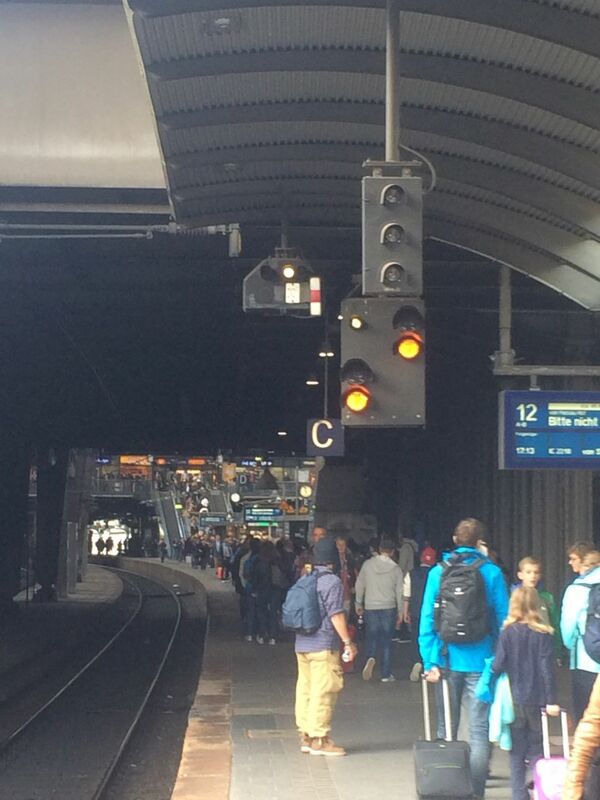 An exit signal at Hamburg Hbf displaying Hp 0+Sh 1: stop for trains, shunting permitted. below you see the signal number plate (S10), an Zs 3 permitting max. 30 km/h and the white-red-white post plate making this signal absolute. When a signal is operationally switched off, is is not dark but displays a Kennlicht (marker light), to distinguish it from a failed signal. So the white light means: Deem this signal as not existent. The full picture shows also a triangular Zs 3 speed signal. The diamond-shaped sign to the right is an El 6 announcer for the end of catenary. The same signal displaying a Zs 1 subsidiary signal. This is used to allow the train to pass in case that the signal has failed or cannot be switched to clear due to interlocking problems. 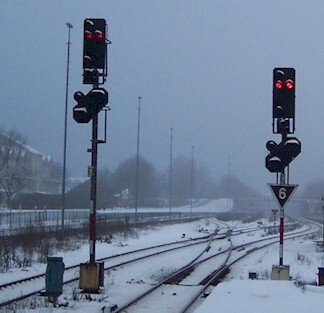 Zs 3 speed signal (extinct), main signal head at stop, Zs 7 subsidiary signal, and a distant signal head with additional light to indicate that the following main signal is closer than braking distance. The Zs 7 means that the signal may be passed at danger, and the driver has to drive on sight towards the next main signal. Below the distant head you see the signal number plate, see numbering of signals.